Sow January-February under glass, plant out early summer. Or sow in autumn for earlier fruiting. Alpine type that grows in a clump and does not produce runners. Masses of red, sweet strawberries. 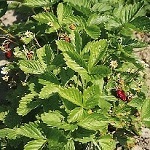 Deep red, very sweet fruit which, if sown and planted out early enough, should fruit first season.